As you know “10 Cloverfield Lane” came a little out of nowhere, and the trailers gave very little information. It involved three people sitting at a dinner table together, some upbeat music played in the background and for the most part everyone seemed happy enough together. Maybe they’re even a family. But obviously there are hints of something deeper underneath the surface. Things quickly become very tense as the girl tries to make a run for what we now see to be the exit of an underground shelter, but she’s stopped in her tracks when she gets a look out the window. Why she would be trying to escape and what exactly is going on outside to keep these three locked away underground is the mystery we have to see the full film to solve. You’re not likely to want to know anything more before seeing this film. So as a word of warning, even though I’ll try to keep this brief, you may want to come back to this after seeing the film. Is it worth it? In a word, yes. That should be enough until you’ve seen it. But of course, I have more things to say. 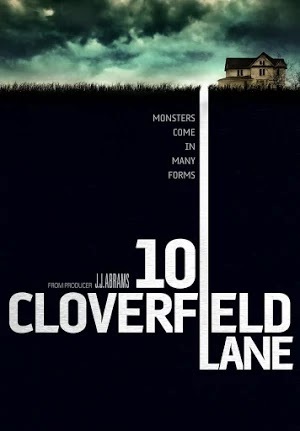 Abrams considers this more a “blood relative” to 2008’s found footage, monster thriller “Cloverfield” rather than an actual sequel. It exists in the same world. Perhaps it’s happening at the same time, but in another location. Either way, it feels like a smaller more character driven thriller that serves as a preamble to whatever it is Abrams has in mind for an actual sequel. Yet it almost feels like two movies, but to explain why might run the risk of spoiling things, even if I only attempted the vaguest of explanations. If you see this film, you’ll know what I mean. And if you’re still with me to this point I’ll assume you’re not afraid of what you might read (again I’ll keep it brief and hopefully spoiler free). It begins with a silent sequence in which Michelle (Mary Elizabeth Winstead) furiously packs her belongings to flee the life she’d established with her fiancé. We never see him, but his name, Ben, appears on her phone as she’s driving away. They’d had a fight and she left without telling him. A story she tells later in the film indicates that she’s known to run when things get tough, and things get much tougher for her once she ends up in the underground shelter we saw in the trailer. As she turns on the radio hoping for distraction, a truck runs her off the road, a scene that's strikingly intercut with the title cards. After a few flips and a blackout she finds herself waking up but not where she expected. In her left arm is an IV bag with what we can assume helped her in her time of need, but on her right leg is a locked brace chaining her to the wall. Eventually her socially awkward host, Howard (John Goodman), informs her that there’s been an attack. He can’t be sure whether it was nuclear or chemical, nor whether it was the Russians or perhaps even Martians who did the attacking. Either way, he suspects aliens are involved, but he knows the air outside is dangerous. His proof is two of his pigs (he lives on a farm out in the country), that died just outside the storm shelter from exposure. We can never tell how much of what Howard says is true, if any of it, because just as often as details emerge to support his claims, Michelle finds things that lead to doubt about his stories. Nevertheless, a sense of unease about the situation and the people involved is never absent. John Goodman’s performance here is one of the best I’ve ever seen from him. It’s a reminder of what a great talent he is. He is believably socially awkward. He never plays it up or adopts strange ticks or stammers. It’s a confident performance. He's a tinfoil hat conspiracy theorist, who sounds crazy, even he might be right. He may have more knowledge on the subject than we suspect, but is he telling the whole truth? There are shades of a nice person underneath the tough exterior and bad temper, but his intentions are always in question. His wife left him and took his daughter with her, and he rarely stops talking about the daughter he’ll likely never see again. The film repeatedly hints that Howard sees Michelle as some sort of replacement. There's an honesty to the performance when he clearly feels hurt that she doesn't seem to appreciate what he built, or that he saved her life by bringing her into his shelter. Yet we fear he believes the fact gives him the unreasonable expectation that he owns her life. But there’s a third character in this story. Emmett (John Gallagher Jr.), unlike Michelle, actually chose to be there. He had helped Howard build the place, and forced his way in as Howard tried to lock himself away as news of the attack broke. He’s about Michelle’s age and seems good natured enough. He cows as much as Michelle when Howard raises his voice. Emmett becomes her trusted ally in this hellish situation. John Gallagher Jr. gave a great performance as the similarly good natured, but far more emotionally wracked love interest for Brie Larson in “Short Term 12.” Here he gives a similarly subtly effective performance. Yet it’s Goodman and Winstead who shine here. Winstead a veteran of both smaller indie dramas and sci-fi, horror B movies feels right at home in this film that features elements of both those genres. She plays Michelle as a capable person who, even when backed into a corner, we can see the wheels turning in her head while she works out clever escape plan after clever escape plan. She may just have played every possible emotion in this film, even if the most constant ones are fear and anxiety. Rather than finding tense situations based on dumb decision making, we anxiously wait to see how she'll get out of the next situation she finds herself in. The ending, is where things change. Without stating anything too specific, it’s likely where the film will lose some viewers. It may not work for a lot of viewers. It's certainly the conversation piece here, and that's sad considering the great lead performances. Yet, this tightly crafted, well performed, extremely tense piece of human drama finds a way to explode into unexpected territory that feels tonally different from everything that came before it. But that's all I'll say about that. It was written by a handful of people including “Whiplash” director Damien Chazelle. It makes sense then that there are shades of the J.K. Simmons character found in Howard. It even began as a project for Chazelle, but he would go on to direct "Whiplash" of course. Abrams himself was busy with "Star Wars: The Force Awakens," and served as Producer on this project instead. The film does bear his characteristically witty sense of humor in a handful of places. The job then fell to an untested director in Dan Trachtenberg. And what a confident and well crafted debut feature this is. This is about as well paced a film as I’ve seen in some time. Like a smart thriller, it holds onto its secrets patiently doling them out in a timely manner. It knows how many cards it’s holding, and knows when to play them. It’s hard to maintain such intensity, but “10 Cloverfield Lane” is non-stop. It’s “Room” meets “War of the Worlds” with a hint of “Fallout,” and it’s as engaging throughout as any one of them.